Paper is a fascinating product. Being the son of a paper maker (my father worked many years for a paper manufacturer) I developed early on a fondness to paper. And Houdini's Paper Magic is all about paper. Tricks with paper, paper folding, paper tearing, and paper puzzles. It seems today paper folding was replaced by balloon modeling. I have only seen once an act entirely based on paper tearing. 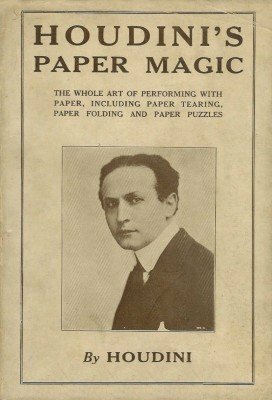 Maybe this ebook version of Houdini's Paper Magic inspires one to build an act around paper. This book is definitely a good start. The Modern Conjurer has also an excellent chapter on paper folding. 1st edition, April 1922, E. P. Dutton & Company, New York; 2nd printing, August 1922; 3rd printing, May 1929; 4th printing, January 1934; 5th printing, December 1941; later reprinted by Magico Magazine, New York; 206 pages. PDF 113 pages.